The 2016 Energy Balances publication presents energy data for over 200 countries and areas in a format which shows the overall picture of the yearly production, trade, transformation and consumption of energy products utilized in each country or area shown, for the years 2015 and 2016. Such a format, presented in a common energy unit, the Terajoule, is useful in assessing and analysing supply and consumption patterns across both products and countries in detail on an internationally comparable basis. 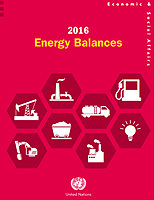 It is the fourth issue of Energy Balances as a stand-alone publication, replacing the previous series of Energy Balances and Electricity Profiles. The standards brought about by the International Recommendations for Energy Statistics (IRES) have been incorporated. The publication is available in printed and electronic (PDF format) versions.